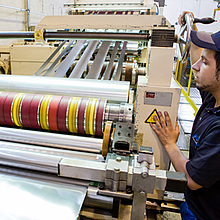 In only the one operation, our precision longitudinal slitting centres cut and coil the thinnest strips and foils with sensitive surfaces. These centres can cut rolled strips and foils up to 1,000 mm wide and with thicknesses from 1.0 mm down to 0.015 mm, and this with strict adherence to the tightest of width tolerances. At the same time, we pay particular attention to good cut and edge conditions. Moreover, our precision longitudinal slitting centres feature integrated systems for deburring, wetting the surface (e.g. with oil), and cleaning the strip (e.g. de-oiling).